The Balcony is spacious and fully furnished. Pacifico is a gated and secure community in Playa del Coco. Just outside the condo is a new lazy river pool surrounded by a large terrace for sunbathing. Between the two big pools is a nice Jacuzzi. Pacifico Beach Club at Playa del Coco. Enjoy the private beach club. The Beach Club provides everything you need for a full day on the beach. Go to the Village if you want delicious coffee and gourmet food. Supermarktet at the entrance of Pacifico. Automercado has a very broad assortment of products from the States and local products. Enjoy the sunset from the Beach Club. 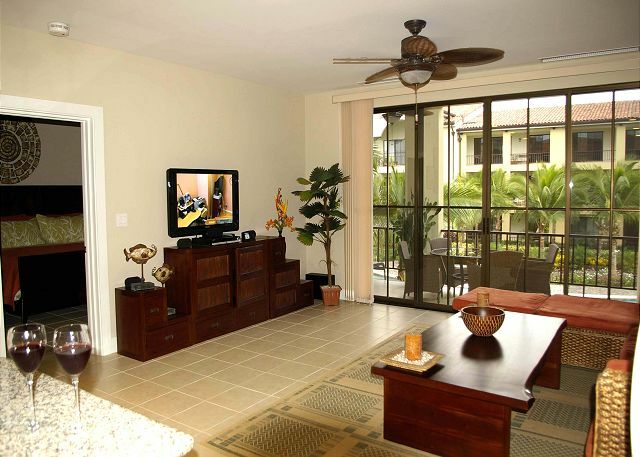 Spacious balcony outside living areas is fully furnished and overlooks lazy river pool. The living area and kitchen are open and spacious. Flat screen TV, sterior and dvd add to the enjoyment of this condo. 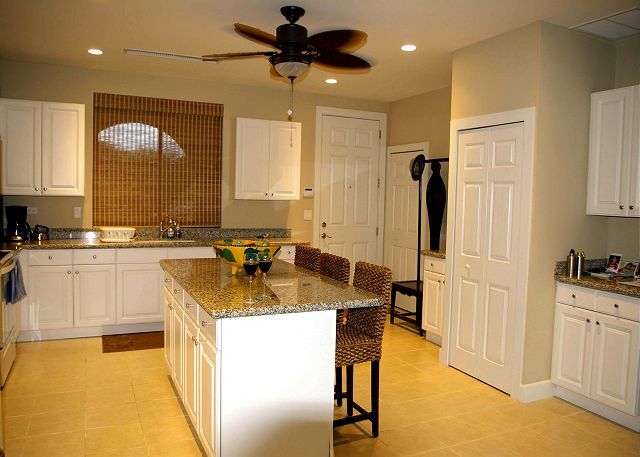 Incredible kitchen fully equipped with everything you need. The Kitchen is fully equipped with all you need. Luxury is the only word to describe the master bedroom which opens onto the balcony. The Master Bedroom has a private bathroom and access to the large balcony. The bedroom is equipped with flat screen TV, storage and lounge chair. The Master Bathroom has double sinks and a large walk-in shower. This spacious one bedroom condo is richly appointed with beautiful furnishings and fully equipped with all the amenities of home. The condo overlooks one of three large pools located in the exclusive Pacifico Condominium Resort in the heart of Playa del Coco. Pacifico #L210 is the perfect getaway for couples or a small family. With 1200 sq.ft. of living area, each room in the home is spacious. The living area opens to a large balcony ideal for enjoying the ocean breezes or simply stargazing. Relax, put your feet up, and enjoy the large flat screen TV after a day of adventure in Costa Rica. The kitchen is a gourmet's dream with granite counter tops, an island for dining or serving, complete with full service, small appliances and utensils. The master bedroom is furnished with a luxurious king bed that boasts fine linens and pillows. The bedroom also has a flat screen TV for your entertainment. The sliding glass doors open to the balcony. The large master bath has double sinks and walk-in shower. 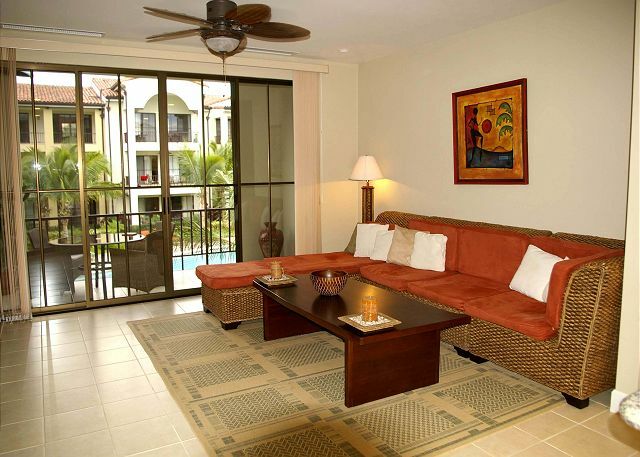 Pacifico Condominium Resort is a 5-star gated community with tropical gardens, beautiful pools, and 24 hr. security. Just outside the development is a retail center with a supermarket, shopping, bank/ATM, coffee shop and restaurant. Pacifico is within easy walking distance of the many restaurants, bars and markets of Playa del Coco. As a guest of Paciifico #L210, temporary membership to the exclusive Pacifico Beach Club is available during your stay for an additional $70 a week per person (per condo). The Beach Club is located around 1 mile from the community and free shuttle is provided every day. This was the first time using HomeAway. I will definatly us it again. Pacifico community is amazing! I can't say enough about the 3 separate huge pools, food/drink staff onsite and eagerly waiting to take your order, community location (only a few blocks from Playa del Coco!) and easy access to an American like grocery store right outside the community. We had friends staying in Hermosa and 20 minutes down the road that daily would find themselves coming to our part of town for all the fun activities. This is the spot to be in! L210 was lovely, great location for a vacation. The condo furnishings were also in very good taste, clean and the kingsize mattress was very comfortable. I would guess that this development was built maybe 8 years ago...not certain. The appliances are older, but in good working order. There is a dishwasher, but I chose not to cook, so just hand washed. There are enough towels, if you need to...there is a stackable washer and dryer in the unit. The quality of the cabinets was not what you would expect...but...who cares. It was a nice touch to have some beer, bottled water, snacks and coffee upon arrival after a long day of travel. Thank you Milagro. Franco was very professional and spent time explaining the local areas to visit. He was on time at check-out as well. The condo is represented very accurately on VRBO. There is also a safe if you need to use it. Pacifico is probably an investment for most owners. Most of the people that stayed there that week were from Canada, US, etc. I did not find it "walkable" getting back to the condo from town is up a big hill (but to clarify, I have had 8 knee surgeries). If you are young and fit, no problem. Excellent condo, large kitchen, large living room with big screen tv, large balcony overlooking pool, king size bed with large ensuite bathroom. AC, cable worked well but could not get NBC. Loved convenience of washer/dryer in condo. dishwasher was a plus too. Close to grocery store, was able to walk to it through rear gate. Close to shopping, bars and restaurants. Our concierge Frazer, helped us out with whatever we needed. Condo does not have a phone, but we brought our magic jack with us to call home from our computer. Would definitely recommend this property. Enjoyed a wonderful, extensive stay here. The grounds and pools, as well as the condo unit, are well maintained and everything you need is within a short walking distance. Relaxing experience. Everything appeared as expected, only a few conditions that could have improved upon. Our condo was very clean and spacious. The grounds and pools are immaculate and the staff is very friendly and helpful. The property was clean, gorgeous, and always maintained. Location was great (you can get to the beach in 10 minutes or by golf cart). There are a number of great restaurants around. The pools are great for families and older folks as you can gradually walk into deeper water with no steps. Loved our trip! We stayed in a beautifully appointed one bedroom condo at the Pacifico. Laura from Milagro handled all the arrangements from the time we booked it until we left. She provided some very useful information to us prior to our arrival and handled all aspects of our stay very professionally. Would definitely recommend this resort for anyone who would love a quiet, secure week in a beautiful setting with lovely pools and easy access to the beach. Enjoyable stay in Pacifico in Coco. The condo was very nice. It overlooks a beautiful and well maintained pool and gardens and has all the amenities one could expect. 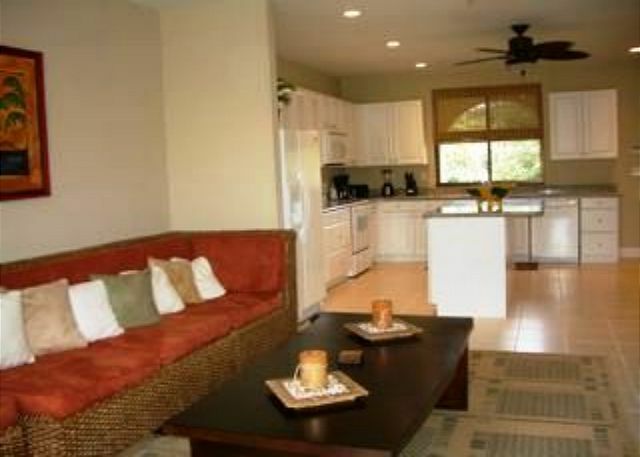 The location is within walking distance to the beach, restaurants, shops, and groceries. Laura and Jennifer at Milagro were excellent with helping us get booked and situated at Pacifico. Would highly recommend both the condo and Milagro. We plan to return and would rent L210 again in the future. Had a wonderful relaxing time. Had a lovely stay. The Condo was a home away from home and we loved the location. We met our daughter and her fiance at Milagro for their wedding ceremony. Milagro managed details and we had a great dinner at their beach club. Mornings and early afternoons by the pools drinks and lunch from the cabana. What could be better? Laura (our concierge) was amazing, arranging special tours (Tempisque River and snorkling on a private beach) to fit our schedules. It was an amazing honeymoon and the condo was very beautiful. It made our vacation very exciting and relaxing! Nice condo with lots of light. Also well equiped. Great service from Milagro.Only drawback, we would have prefered a more secured internet. We had a great stay at Pacifico. Pamela did a wonderful job in providing the orientation and useful information. The bowl of food prdoucts on arrival was a very welcoming act. We loved the size, spaciousness, cleanliness, and location of Pacifico. They gym was great. The Pacific staff were all very nice. We look forward to a return visit. Lovely location, condo was well equipped, absolutely everything met my expectations. Which is saying something as I am fussy. Pacifico L210 was perfect. We especially appreciated the location. It was wonderful to be able to walk to everything. The rate was extremely reasonable. Working with Milagro Management has been great both times we've been to Costa Rica. They are available and helpful to answer any questions that might come up. They have connections with tours and other services that enhance your stay. My husband and I highly recommend them and feel fortunate that they manage the property that we return to. We really enjoyed our stay at Pacifico #210. The unit was new, neat, clean, well equipped and very safe in a gated community with lots of security - we felt very comfortable for our first visit to CR. We especially liked having the washer and dryer in the unit so that we could launder our beach towels, beach clothes, etc. and did not need to pack as much because of this convenience. The property managers were wonderful to work with right from the start. We arrived to our unit to find snacks, Costa Rican coffee, milk, juice, and even a cold 6-pack of beer in the fridge waiting for us, compliments of Milagro! Next, they arranged 2 tours for us with awesome guides (Bernal & Alvero) at Tico Tours that really enhanced our visit. When plans for a tour that we had independently booked fell through and we were having difficulty booking another due to the fact that we do not speak Spanish. We called Milagro and Sue, Pam, & Kiki pulled through for us - booking us a tour for that very afternoon and making sure that it was exactly what we wanted. The pools & grounds right at the property were just as incredible as the unit itself. 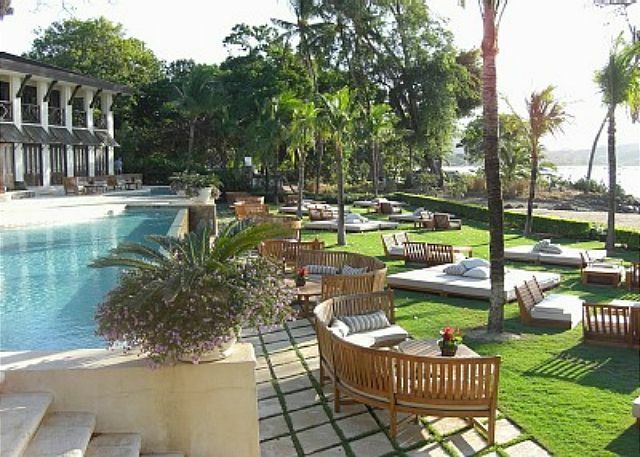 We also made use of the property's beach club which was only a few blocks away from the unit. The beach club had comfy chaise lounges, cabanas for shade, infinity pools & a jacuzzi - just keep in mind that you can not bring your own food or beverages onto the premises but the prices there were very reasonable. I would definitely recommend both Milagro property management and the Pacifico unit #210 to others as we had an amazing experience with both. We were very impressed with our whole travel experience. Any time you can spent a month in Costa Rica, it is a great time. The weather is perfect and the people are the best. Food is the freshest you will have at any restuarant. Pacifico is the place to stay, with the 5 minute walk to everything, including Jimmy's Bar. As a frequent vistor to Costa Rica, we enjoyed doing the Zip Line down the Rincon Volcano, awsome. Our first stay at Pacifico, but definitely not our last! We can't say enough about our stay at Pacifico, in Playa del Coco, Costa Rica. It is exactly what we've been looking for. We loved the Costa Rican people, and enjoyed getting a feel for that part of the country. The condo at Pacifico was immaculate, beautiful and had everything that we needed. Pacifico was convenient to grocery stores, restaurants and shopping. The Pacifico Beach Club was very nice, and we enjoyed having access to that as well. Working with Milagro Management was a key part of having everything go so smoothly. They are a friendly, professional company that provides excellent service to their clients. It was so helpful to know that they were available to answer any of our questions. In addition to the property, they can arrange anything that you would want to do on your trip to Costa Rica. We definitely recommend working with them.